Trump Says There’s No Evidence of Collusion. There Is So Much Evidence Already. “Would any defense lawyer advise @realDonaldTrump to meet with SC Mueller? 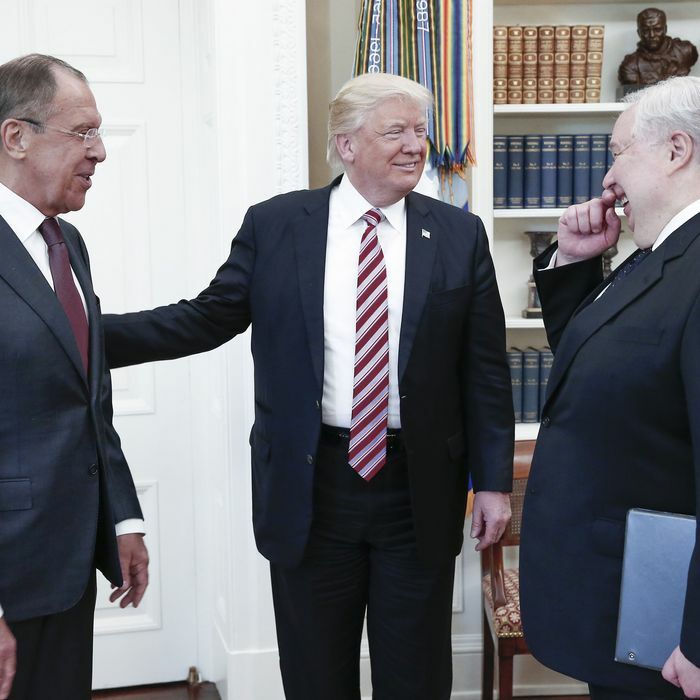 In the absence of any evidence of collusion, why?” asks conservative pundit Hugh Hewitt. “No collusion = end of inquiry.” The idea that Robert Mueller has no evidence of collusion, and that he has instead diverted his interest into the secondary crime of obstruction of justice, has been taken up by Trump and repeated on the right so frequently it has settled into seeming hardened fact. You might know that a man ran into a building with a gun, then a person was shot in the building, and then the man ran out. All this would be evidence he committed the murder, while perhaps falling short of proof. Proof is a very high standard to meet. But evidence of collusion? There’s simply no question that there is evidence. Lots and lots of it. What do we know about Manafort? We know he ran the campaign of a pro-Russian candidate on behalf of Russia previously; that he had taken on massive debt to a foreign patron, Oleg Deripaska; that Deripaska was working on behalf of the Russian government’s foreign policy; that Manafort accepted his position as Trump’s campaign manager for free; and that he hoped his work for Trump would help him “get whole” with Deripaska. Does that prove Trump’s campaign manager was working with Russia? No, but it certainly counts as evidence. Want more evidence? Okay. Trump campaign adviser George Papadopoulos met with a Russian agent who told him he had dirt on Hillary Clinton, later boasted that Russia had obtained damaging Clinton emails, and lied to the FBI about his contacts with Russia. That would also qualify as evidence of collusion between the Trump campaign and Russia. Peter W. Smith, a veteran Republican political operative, attempted to obtain stolen Clinton emails and told the people he contacted in pursuit of these emails he was working on behalf of the Trump campaign. When one of the cybersecurity experts he contacted warned Smith that his work might involve collusion with Russia, it did not dissuade him at all. That also seems like evidence. Trump confidant Roger Stone reportedly knew about stolen Clinton emails, emailed with the person who had the stolen material, publicly flaunted his advance knowledge of these emails, and also spoke regularly with Donald Trump during the period when he had this knowledge. It is a virtual certainty Stone colluded with Russia on the email hack, and highly probable he made Trump an accessory after the fact. Then of course there is the 2016 Trump Tower meeting. I would argue that the publicly available information pertaining to that episode amounts to proof of Trump campaign collusion with Russia. You have a Russian agent dangling Russian assistance in the election (“part of Russia and its government’s support for Mr. Trump”), and the offer of help being accepted (“if it’s what you say I love it”). It doesn’t even matter to what degree or even whether the offer was actually followed through. If you take a meeting to plan a crime, and the crime later happens and you benefit, you are an accessory to the crime whether or not you participated after the meeting. But even if you don’t consider the Trump Tower meeting to be absolute proof of collusion, it is certainly evidence of collusion. It was, after all, a meeting held for the express purpose of furthering cooperation — or, as it were, collusion — between the Trump campaign and Russia. And there is no reason to believe that the publicly available evidence of this meeting — which Trump and his family have lied about, repeatedly — contains the entire extent of the information about it. This has not attracted nearly enough attention. There is clear forensic evidence to show that Donald Trump, Jr. called somebody, quite likely his father, while he was rushing to set up the Trump Tower meeting. House Republicans blocked an effort to prove that Donald Trump was the person he called. The Republican narrative has embraced the fantastical interpretation first that there is no public evidence of collusion, and the even more delusional offshoot belief that Mueller therefore has no private evidence of collusion. The intent of saying this, of course, is to enable Republican efforts to obstruct or eventually end the probe, which they can justify on the grounds that there was no evidence of collusion anyway. And they are advertising in advance their intent to declare Trump innocent of wrongdoing regardless of how damning the final indictment may be.